By David Ponce on 05/13/13 • Leave a comment! 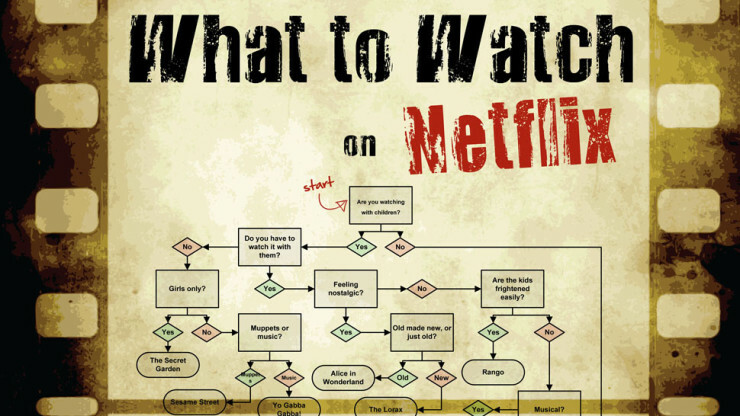 The common wisdom is that you generally spend more time looking for stuff to watch on Netflix than you do actually watching anything. And even though the company has spent tremendous amounts perfecting its algorithm (even handing out $1 million back in 2009), that doesn’t mean it’s perfect. Of course this should give you some perspective about the above flowchart’s ability to actually find you some good content. For one, it’s made by some folks over at Silver Oak Casino. Flowcharts are like infographics these days: hastily made gimmicks to draw some traffic, and this is likely no exception, so take it with a grain of salt. That said, clearly a lot of work went into this one, and some of its suggestions are solid. Breaking Bad, House of Cards, Law and Order and other decent shows are arrived at through a pretty sound decision-making tree. Yeah, not everyone is going to be happy with it, but if you’re at home wondering what to watch, why not give this a try? We’re including a 740px wide version after the jump, and if you click on the image, it’ll take you to a large 6.6MB HD copy (which doesn’t even seem to fit in this MBA’s screen for some reason…).